Each Tube also includes 50 Connectors and a Free Set of Glow Ball Connectors to make a Glowball, Bracelets and Necklaces etc. 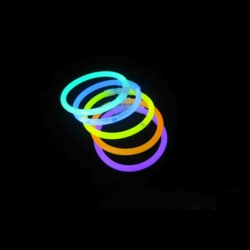 These glow sticks will glow brightly for 8-12 Hours + and are easy and simple to activate by gently bending along the length of the glow stick and then shaking lightly. The Glow Bareclets also come freshly packed and carry a 2 year+ shelf life and come CE Certified meeting current EU Standards and are 100% DBP Free. Great for all occasions, including nights out at Clubs, Pubs, Festivals, Parties, Weddings, Birthday Celebrations, UV Parties, Discos, Fundraising Events and Much More.